Jude Kelly directs Paradise Lost in the ship’s mess. 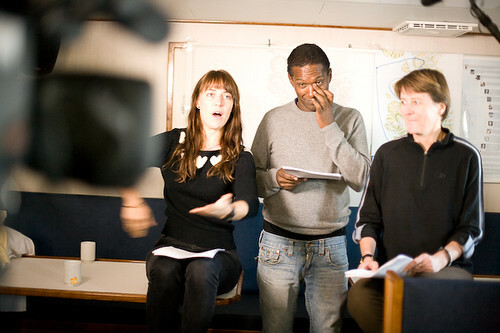 Leslie Feist, Lemn Sissay and Ruth Little performing Paradise Lost. We’ve spent the morning popping in and out of the restaurant for a read through of Paradise Lost – everyone read a few lines. Not looked at the text for more than a decade but feels the natural thing to do here and now as we sail south back to port. A couple of my posts have referred to people’s anxieties about the Baffin Boot sized carbon footprint that coming on this trip entails. Sin and redemption are so woven into western culture that we shouldn’t be surprised that we frame these questions about individual responsibility in terms of sin and the pursuit of redemption. A few years ago Patriarch Bartholemew (leader of the orthodox church) announced that environmental harm was a sin (the Pope followed suit soon after). Of course they have a natural advantage over science and policy people when it comes to finding a language that seems to have the right kind of scale: they’ve been phrasemaking on the big questions for centuries. 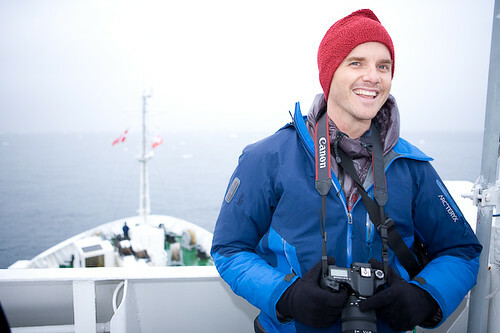 Graham Hill, founder of TreeHugger.com joins the boat in Ilulissat, along with beatboxer Shlomo and Jude Kelly, Artistic Director of Southbank Centre.